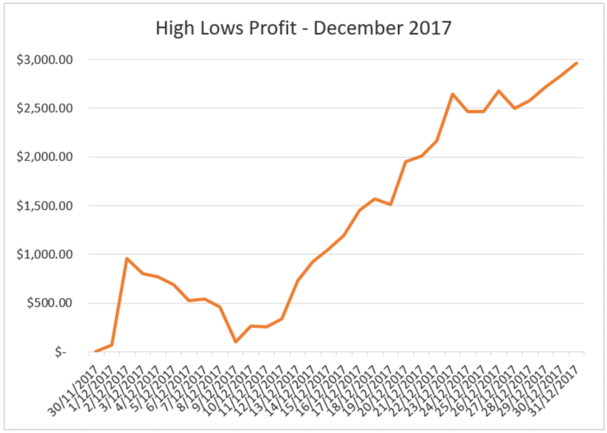 The High Lows made $2959.75 profit in December 2017 over 474 bets at 13.7% P.O.T. It was a nice month, particularly given that it’s a quieter time of the year. We got off to a flyer on December 2 making $889 profit, followed by a downswing between December 3 and 9, losing $859.30. It was almost nothing but profit from December 10 to 31 with 19 out of 22 winning days. We had $21,650 turnover in December, which is excellent for this time of year. The magic formula is Profit = Turnover x P.O.T. so assuming you have P.O.T., the higher the turnover, the better. A selections were down a tad on their historic figures with $1539.25 profit at 13.1% P.O.T. This is fine. B selections had a better month than average with $1383 profit at 14.0% P.O.T. We had one D selection on Bet 372, which we backed blind and it won for us, so we had some nice luck there. The proportion of A:B selections was good again. 66% of our bets and 54% of turnover was on A selections. Fixed Odds was our best performer by a long way with 86% of the profit in December. Multis had a bad month winning 4 out of 30, including 15 losers. Their all-time record is very good, so no issues there. Line bets produced some nice results, which are discussed further below. We had our first “Winner of Toss” bets this month, which makes me laugh. It’s a mug’s bet really (who wins a coin flip) but surprisingly provides the best way to approach one of our bets. Most of our profit this month was on Horse Racing and Cricket, with Big Bash 7 starting on December 19. We’ve made a nice start to the tournament with $1151.65 profit at 14.2% P.O.T. We also had our first “Sailing” bet in December on the Sydney to Hobart. It lost (despite being Black Caviar-type odds!) and made it 26 different racing codes and sports we’ve bet on all-time now. Line bets made a nice recovery after a poor start to the month. 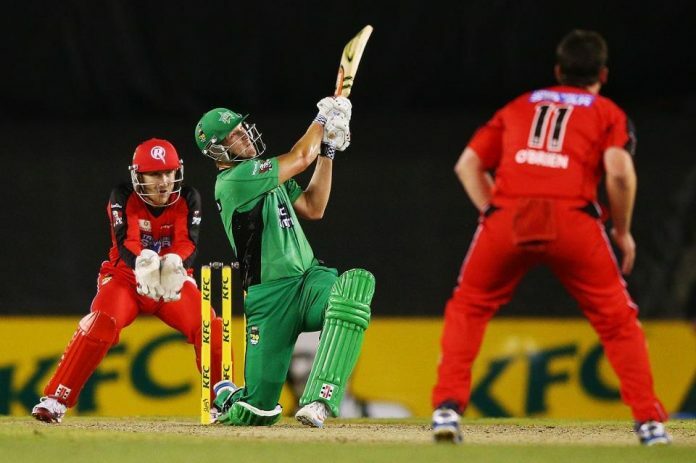 Once we started playing unders on the Big Bash, we made $844 profit and won 6 out of the last 7 matches. It may be recency bias and I don’t purport to being a cricket expert, but the Under Runs line appears to be a great bet on T20 cricket. The bowling has improved/batting has struggled in the Big Bash this season but the good thing about this bet is that you essentially get a double chance to win. If your team bats first, then it is pure and simple whether they make the line or not. However, if your team bats second, you might have won before they start batting because the team batting first made a total under your line. Even when the chase total is above your line, your team can still bat poorly and make a low score. We should thank C who got in touch about unders and prompted me to think about this. It’s just 7 bets but this result has been a nice reinforcer of an important lesson: as soon as you realise you could be doing something better, start doing it on the next bet (see Commitment Bias). States were in line with expectation this month. Not much to add here except to say it was a strong month for all where profits were 15-fold the monthly fee plus some. December was a nice way to finish the year and made it 11 out of 12 winning months in 2017 including the past 11 months straight. The Big Bash continues in January and we also have the Magic Millions on the Gold Coast, NFL Playoffs and Australian Open Tennis, so there’s plenty of action coming up, which usually means plenty of $$$. We’ll shoot for 12 months straight profit in January and after a near clean sweep in the cricket last night, we’re well under way to achieving that mark. So, if you’re reading this as a non-member, jump on board and enjoy the profits with the rest of us! Rod is the brain behind our simply brilliant High Low membership. As you can see, consistent profits are the norm for the High Low, with very little risk accompanied by big rewards. So if you enjoy punting on sports and racing, and winning while you’re at it, then join the High Low now.